Discover the newest addition to Rye Preserve! 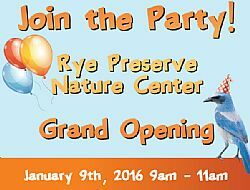 Manatee County is excited to announce the grand opening of the Rye Preserve Nature Center, and wants YOU to join the celebration! This family-friendly event will include a ribbon cutting for the new site and a variety of fun activities. Manatee County staff will take visitors on guided tours of the Center, and lead special hands-on activities that highlight each exhibit. Outside of the new Nature Center, volunteers from the Palmetto Historical Park and the Florida Forest Service will be on hand with activities that highlight the history of Rye and its uplands habitat. Visitors can also enjoy light refreshments, sponsored by Mosaic, after the tours and fun. The Rye Preserve Nature Center is a combined effort of Manatee County staff, volunteers and great sponsors who all came together to help create a truly unique site for eastern Manatee County. It will be open during programs and special dates each month; join the fun at this first opportunity to see the new resource! The celebration will take place in front of the Nature Center near the pavilion.